Rahaei, Omid. (1395). Natural Ventilation: Analysis of Indoor Airflow in an Assumed Cubic Building with Opposite Openings by CFD Investigations. معماری و شهرسازی آرمان شهر, 9(16), 39-57. Omid Rahaei. "Natural Ventilation: Analysis of Indoor Airflow in an Assumed Cubic Building with Opposite Openings by CFD Investigations". معماری و شهرسازی آرمان شهر, 9, 16, 1395, 39-57. Rahaei, Omid. (1395). 'Natural Ventilation: Analysis of Indoor Airflow in an Assumed Cubic Building with Opposite Openings by CFD Investigations', معماری و شهرسازی آرمان شهر, 9(16), pp. 39-57. Rahaei, Omid. Natural Ventilation: Analysis of Indoor Airflow in an Assumed Cubic Building with Opposite Openings by CFD Investigations. معماری و شهرسازی آرمان شهر, 1395; 9(16): 39-57. Assistant Professor of Architecture, Department of Architecture, Shahid Rajaei Teacher Training University, Tehran, Iran. The natural ventilation is an easy way to exchange the indoor polluted warm air with outdoor fresh air. The wind power injects outdoor fresh air into the building. A good indoor air current and subsequently a proper exhaust depend on the openings’ conditions and their situations. A serious architectural question is under what conditions of the openings the wind-cross ventilation can be effective, and the required indoor air current in the enclosure is established. The purpose of this article is analyzing the conditions of indoor airflow in an analytical architectural model to upgrade the natural ventilation by focusing on opposite opening’s conditions. This research considers some wind driven ventilation manner with respect to openings circumstances in an assumed cubic model. The research method includes a numerical simulation using a validated computational fluid dynamics (CFD) model. It investigates and compares the performances of different models of airflow currents in a natural ventilation process and subsequently the indoor airflow paths, under the different conditions of the openings in a fixed boundary condition model; the simulations are performed in an assumed model (a 6×6×6m cubic building with just 2 opposite openings in stationary walls as boundaries of the model) by using Gambit and Fluent software. With an analytical method (using Fluent) the gathered data would be analyzed. Finally the results are presented and generalized: the results demonstrate that whatever the wind speed is, the indoor airflow condition depends on the situations of the openings. It means that the quality of winddrive cross ventilation and its path is not depended on the wind speed. Besides for establishing proper natural ventilation, the opposite windows must not be installed in front of each other, or in the same level. Diffusion Laboratory, Colorado State University, CO.
Amidpoor, M. (2010). Investigation of Domestic Flueless Space Heaters Effects on Indoor Air Quality,Research Project, Iran: Khaje Nasir University, Department of Mechanical Engineering. Arens, A. D. (2000). Evaluation of DisplacementVentilation for Use in High-ceiling Facilities, Master’s Thesis, Department of Mechanical Engineering, Massachussets Institute of Technology, Cambridge, USA. Aynsley, R., Melbourne, W., Vickery, B. (1977). Architectural Aerodynamics, London: Applied Science Publishers, pp. 254. Streams, J. Fluid Mech, 79 (2), 307–335. Conservation in Buildings, Changsha, China. through Doorways in Refrigerated Rooms. International Journal of Refrigeration, 25, 1102–1109. Saving: A Case Study, International Journal of Energy Research, 31, 743–759. Ghobadian, V. (2012). Tarahi Eghlimi. Tehran: Tehran Uni. Ltd.
Groat, L., & Vang, D. (2004). Research Methods in Architecture (A. Einifar, Trans. ), a. Tehran: TU Ltd.
Store by Means of Computational Fluid Dynamics. International Journal of Refrigeration, 23, 127–140. Weight Loss of Cooked Ham During Air-blast Chilling Process. Journal of Food Engineering, 46(3), 189–198. Analysed as a Catchment Problem and as a Pressure Driven Flow, Int. J. Vent. 1, 89–101. Kasmaei, M. (2011). Eghlim & Memari. Tehran:Khak Ltd.
Conference, Palm Springs, USA, 18–22 September, vol. 1, 233–242. of Crossventilation, Part 1: Theoretical Framework. Int.J. Ventilation, 2 (4), 371–382. Liddament, M.W. (1986). Air Infiltration Calculation Techniques: An Application Guide, AIVC. Loomans, M., & Mook, F. (1995). Survey on Measuring Indoor Airflows FAGO, Report 95.25.W., Eindhoven University of Technology Sweden. Meat Chiller. International Journal of Applied Science and Computations, 5(1), 11–24. Deux Tunnels De Re´Frige´Ration Des Viandes. Revue Internationale du Froid, 18(6), 403–412. Large Food Chillers. Computers and Electronics in Agriculture, 34, 67–88. Ceilings and Displacement Ventilation Systems, Energy and Building, 34, 497–509. 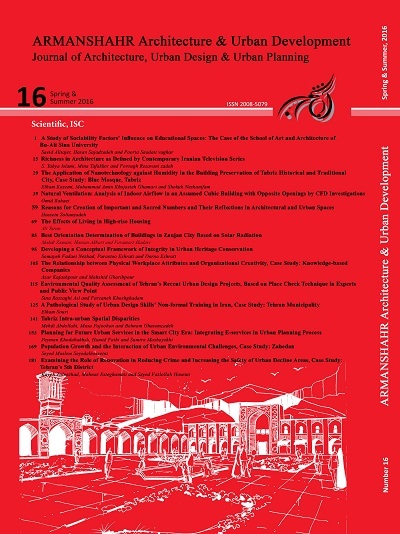 in Industrial Buildings, Armanshahr Architecture & Urban Development Journal, 12, 69-81. Rees, S.J., & Haves, P. (2001). A Nodal Model for Displacement Ventilation and Chilled Ceiling Systems in Office Spaces, Building and Environment, 36, 753–762. Sandberg, M. (2003). An alternative view on the theory of cross ventilation, in: The Proceedings of the First International Workshop on Natural Ventilation,Tokyo. Scott, G. (1994). Computational Fluid Dynamics for the Food Industry. Food Technology InternationalEurope, 49–51. Scott, G., & Richardson, P. (1997). The Application of Computational Fluid Dynamics in the Food Industry. Trends in Food Science and Technology, 8, 119–124. Seifert, J. (2005). Zum Einfluss Von Luftstro Mungen Auf Die Thermischen Und Aerodynamischen Verha Ltnisse In Und An Geba Uden. Dissertation: TU Dresden. Seifert, j. Li, Y., Axley, J., Rösler, M. (2006).“Calculation of Wind-driven Cross Ventilation in Buildings with Large Openings”, Journal of Wind Engineering and Industrial Aerodynamics, 94, 925–947. a review. Computers and Electronics in Agriculture,34(1–3), 5–24. fields of a cold store by CFD simulation. Journal of Food Engineering, 77(2), 355–363.